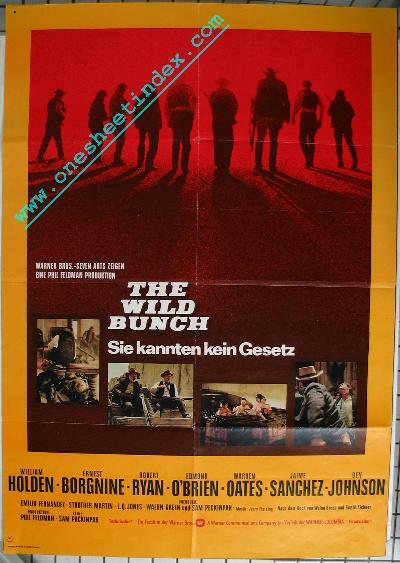 The Wild Bunch, the classic 1969 Sam Peckinpah cowboy western action thriller ("Born too late for their own times. Uncommonly significant for ours. "; "Unchanged men in a changing land. Out of step, out of place and desperately out of time. "; "Suddenly a new West had emerged. Suddenly it was sundown for nine men. Suddenly their day was over. Suddenly the sky was bathed in blood. "; "They came too late and stayed too long. "; "The land had changed,. They Hadn't. The earth had cooled. They couldn't. "; "Story by Walon Green and Roy N. Sickner") starring William Holden, Ernest Borgnine, Robert Ryan, Edmond O'Brien, Warren Oates, Jaime Sanchez, Ben Johnson, Emilo Fernadez, Strother Martin, and L.Q. Jones (born Justice McQueen, he took the name of the role he played in "Battle Cry", and then had a long career in TV and movies, and produced the movie version of Harlan Ellison's "A Boy and His Dog").